Arrested for drugs in South Mississippi? Protecting your freedom is our first concern . We handle multi-kilo cases, major drug conspiracies and all drug charges in Mississippi state and federal courts. We have dealt with DEA, FBI, Homeland Security, Mississippi Bureau of Narcotics and other federal and state investigative and law enforcement agencies. We will represent you against the District Attorney and United States Attorney. We will defend your rights in state and federal court. Was the search of your property warranted? Was the highway stop based on articulable grounds constituting reasonable suspicion? Did the government properly apply for a wiretap? Will the seizure withstand constitutional challenge? Can the government establish possession or control? Did the government have probable cause to arrest? The burden of proof starts and ends with the prosecution. The burden of proof remains on the prosecution the entire time. Don’t automatically assume everything the government says about your case is true. If you have been arrested on a drug charge, don’t give up. Many valid legal defense options may be available to you, even drug treatment. Sometimes people with a documented injury can develop a tolerance, dependancy, or addiction to prescription medication. Life can become unmanageable. The DEA and Mississippi Bureau of Narcotics (MBN) actively monitor dispensing and possession of prescription drugs. “Doctor Shopping,” prescription forgery and possession of non-prescribed medication can result in an arrest and leave a permanent blemish on your criminal record, your job, and your future. Government sting operations based on undercover investigations and sophisticated surveillance by DEA and MBN investigators can lead to an arrest. We have represented clients charged in state and federal court “Pill Mill” prosecutions, drug conspiracies and other controlled substance charges. A state or federal drug arrest can seem overwhelming. You may have alternative options. Pre-trial Diversion or non-adjudication may be options for first time offenders. Drug Court may be available with a prior conviction. Protecting your freedom and your reputation is our first priority. Mississippi was one of the first states to make ephedrine and pseudoephedrine a schedule two prescription medication. Mississippi prosecutors take precursor cases very seriously. Precursors are the chemicals used to manufacture methamphetamine. A precursor substance is a compound inactive in nature. When combined with other chemicals precursors produce methamphetamine. Possession of two or more precursor chemicals knowing they will be used to manufacture methamphetamine carries the same sentence as manufacturing, up to thirty years in prison and a one million dollar fine even for first offenders. If you were arrested while in possession of lithium batteries, camp fuel, ammonia, ether, alcohol, sulfuric acid or acetone, you could face the same penalty that a meth lab conviction carries. Many of the precursor ingredients have legitimate uses. One critical element the government is required to prove beyond a reasonable doubt is that the defendant knew the precursor chemical would be used to manufacture methamphetamine. A meth lab such as a “shake and bake” operation combines precursor chemicals to produce methamphetamine. Cooks use precursors to transform pseudoephedrine into methamphetamine. Mississippi is on the leading edge of the trend that makes ephedrine and pseudoephedrine a schedule two controlled substance, available by prescription only. Both Mississippi and federal investigators aggressively police precursors, meth labs and the chemical waste left over. Investigators use surveillance, confidential informants, trash pulls, snitches, pharmacy and supply store records, and all available sources to bust meth labs. A conviction for manufacture of methamphetamine can impose a sentence of up to thirty years and a one million dollar fine, even for first offenders. Judges and prosecutors routinely receive citizen complaints about the leftover hazardous waste from the manufacture of methamphetamine. Generation of hazardous waste is an independent felony and carries a prison sentence. Meth manufacturing, commonly called “cooking” leaves behind 5 to 7 pounds of hazardous waste for each pound of meth that is made. These hazardous waste chemicals are subject to Mississippi and federal laws. Methamphetamine is produced or “cooked” in clandestine labs and poses a danger to all present including those who cook meth, those who discover the leftover chemicals and those who have to clean it up. While state and federal prosecutors and courts have been very harsh on precursor cases, you do have options. Mississippi law enforcement actively patrols Interstate 10. Specialized license plate reader vehicles scan and search for vehicles of interest. Scan technology stores digital images of the license plates. Those images are cross checked against the database, stored either on a server located in the trunk or on a land-based server via a satellite uplink. The automatic license plate reader works very fast, analyzing hundreds of license plates per minute at highway speed. The license plate reader technology captures forwards a photograph of the license plate of interest, its vehicle, and its GPS coordinates. The Mississippi coastal counties also have a Federal Motor Carrier enforcement unit established under the Federal Motor Carrier Safety Administration (FMSA). The Mississippi Highway Patrol has traveling crime apprehension patrols or TCAP units. Federal Border Patrol enforcement units can be seen every day on Interstate 10. Many of the coastal cities encompass a portion of Interstate 10 where local police departments and actively patrol. Each coastal county sheriff routinely patrols the Interstate 10 corridor and makes traffic stops. The Mississippi Department of Transportation is a state law enforcement agency and has legal authority to stop vehicles on the Interstate 10 corridor. Out of state license plates and rental cars are sometimes targeted for minor infractions. Once stopped, officers are trained to look for nervous drivers and passengers, conflicting driver and passenger statements, and persons traveling with little or no luggage. Highway interdiction officers are specially trained to look for vehicle alterations, fresh paint, over spray, hidden compartments, and odor masking materials such as fabric softener, air freshener and lit cigarettes. Sometimes the officer will write a courtesy citation to document the stop and request voluntary consent to search the vehicle. Interstate 10 drug enforcement also includes investigators with trained drug detection dogs. During the traffic stop, the police are authorized to walk a drug dog around the car. If the dog alerts on the car, the police will believe they have probable cause to search your vehicle. Charges stemming from an Interstate 10 investigations can include drug trafficking, possession of controlled substance with intent, drug conspiracy, money or currency violations, firearms violations, and detection of illegal aliens. These charges can be brought in state or federal court. In the last few years new types of synthetic drugs known as spice, potpourri, and bath salts have appeared. These synthetic chemical compounds were used as alternatives to marijuana and cocaine. Designer drugs originally called “spice” and “bath salts” were legally sold over the counter in convenience stores, gas stations, boutique stores, smoke shops, head shops and over the internet. These designer drugs were packaged with labels such as Ivory Wave, Purple Wave, Red Dove, Blue Silk, Zoom, Bloom, Cloud Nine, Ocean Snow, Lunar Wave, Vanilla Sky, White Lightning, Scarface, Hurricane Charlie, Bliss, Purple Rain, K2 Incense, Cloud 9, MDPK, MTV, Magic, Maddie, Black Rob, Super Coke, PV and Peeve. Many traditional drug screens do not test for spice or bath salts. While spice and bath salts differ in effect, the side effects can be equally harmful. Spice, perhaps so named because of its characteristic strong clove smell, is generally synthetic marijuana. Spice is a mixture of herbs or other crushed plant material laced with synthetic chemicals that are supposed to mimic the effects of THC, the psychoactive ingredient in marijuana. Spice can be ingested by inhaling smoking or swallowing. Marijuana should not be confused with spice which is synthetic cannabinoids. Spice can cause loss of physical control, seizures, paranoia and severe dysphoria. Bath salts are synthetic cathinones which provide a stimulant effect like cocaine. The most common ingredient in bath salts is Methylenedioxypyrovalerone (MDPV). Bath salts can be ingested by smoking, swallowing or snorting it through the nose like cocaine. There are severe health risks attributed to bath salts. The side effects can include hallucination, paranoia and violent behavior. Other side-effects can include insomnia, teeth grinding, agitation, increased risk of a heart attack, kidney failure, liver failure and suicide. Ingesting spice and bath salts has led to emergency room visits, calls to poison control centers and even deaths. The synthetic chemicals can cause severe physical and psychological symptoms. These serious health risks prompted the Mississippi law makers to respond quickly by banning spice, bath salts and synthetic marijuana. Cities and counties passed local ordinances prohibiting spice. Meanwhile the Mississippi Legislature struggled with how to respond to spice. Ultimately, the legislature amended Miss. Code 41-29-113 to treat spice like marijuana. Today, the sale of spice and synthetic drugs has serious felony consequences. Today, possession and sale of spice, bath salts and synthetic marijuana are prohibited under the drug laws. Miss. Code 41-29-113 makes spice, bath salts and synthetic marijuana schedule one controlled substances (no medical use). These chemical compounds are specifically banned and possession or sale is now a crime in Mississippi: CP 47,497 and homologues; HU-210; JWH-018; JWH-019; JWH-073; JWH-200; JWH-250; JWH-398. Further, a ban on cathinones, methcathinone, mephedrone, and Methylenedioxypyrovalerone (MDPV) targets possession and sale of bath salts. Possession and sale of spice, bath salts and synthetic marijuana carries stiff penalties including a felony conviction and possible prison time. Many Mississippi residents may not know Mississippi laws have changed. Possession or sale of spice and bath salts is per se illegal, even if purchased in another state or over the internet. Thus, even out of state residents can be arrested on felony drug charges or even DUI if driving under the influence of spice or synthetic marijuana. If you have been arrested on Mississippi drug charges, contact the Law Office of Rufus Alldredge at 228.863.0123 located in Gulfport, Mississippi. 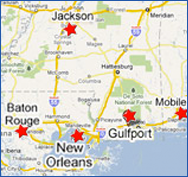 We serve clients in Southern Mississippi. We will fight for your freedom and your reputation.